The Atwater-Donnelly Trio performs a unique and thrilling blend of traditional American and Celtic folk music and percussive dance.Rhode Islanders Elwood Donnelly, Aubrey Atwater, and Cathy Clasper-Torch blend gorgeous and unusual vocals and play guitar, Appalachian mountain dulcimer, violin, cello, mandolin, tin whistle, harmonica, banjo, bones, spoons, limberjacks, and other surprises including Appalachian clog dancing and French Canadian footwork. 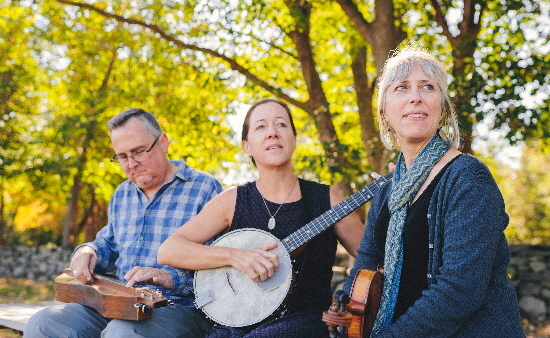 The Atwater-Donnelly Trio performs a unique and thrilling blend of traditional American and Celtic folk music and percussive dance. Rhode Islanders Elwood Donnelly, Aubrey Atwater, and Cathy Clasper-Torch blend gorgeous and unusual vocals and play guitar, Appalachian mountain dulcimer, violin, cello, mandolin, tin whistle, harmonica, banjo, bones, spoons, limberjacks, and other surprises including Appalachian clog dancing and French Canadian footwork. The performance is appealing to all ages and with a relaxed stage presence, Aubrey, Elwood, and Cathy, explain song, instrument, and dance origins to give more relevance to the material. Separately and together, these three performers have won numerous awards and produced many CDs, books, and DVDs which will be available at the performance. They have performed throughout the United States and beyond and their recordings receive international airplay.